Summary: Astronomers have made the first definitive detection of a radioactive molecule in interstellar space: a form, or isotopologue of aluminum monofluoride (26AlF). 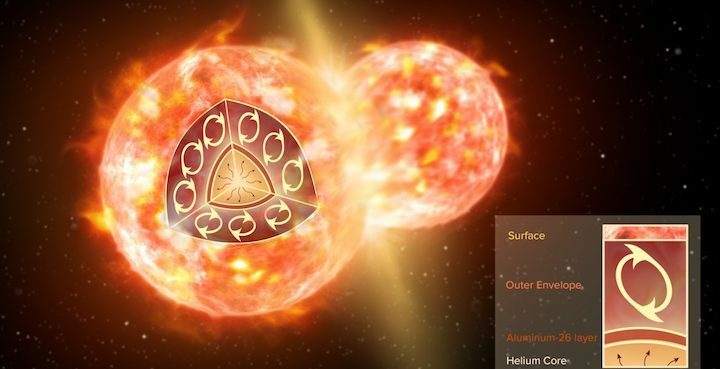 The new data – made with ALMA and the NOEMA radio telescopes – reveal that this radioactive isotopologue was ejected into space by the collision of two stars, a tremendously rare cosmic event that was witnessed on Earth as a “new star,” or nova, in the year 1670. When two Sun-like stars collide, the result can be a spectacular explosion and the formation of an entirely new star. One such event was seen from Earth in 1670. It appeared to observers as a bright, red “new star.” Though initially visible with the naked eye, this burst of cosmic light quickly faded and now requires powerful telescopes to see the remains of this merger: a dim central star surrounded by a halo of glowing material flowing away from it. 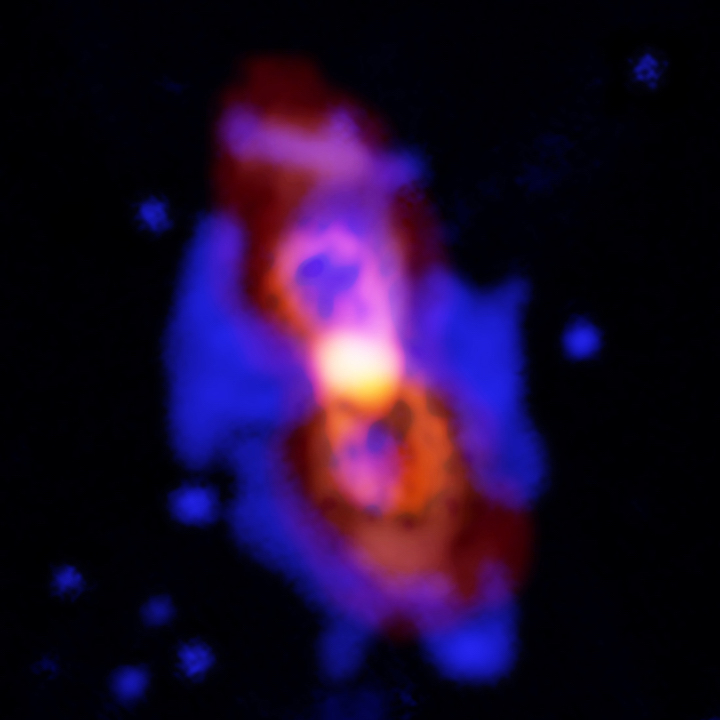 Approximately 348 years after this event, an international team of astronomers using the Atacama Large Millimeter/submillimeter Array (ALMA) and the NOEMA (Northern Extended Millimeter Array) radio telescopes studied the remains of this explosive stellar merger — known as CK Vulpeculae (CK Vul) — and discovered the clear and convincing signature of a radioactive version of aluminum (26Al, an atom with 13 protons and 13 neutron) bound with atoms of fluorine, forming 26-aluminum monofluoride (26AlF). 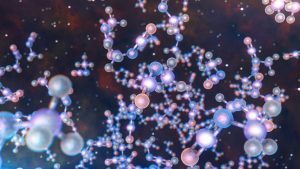 “The first solid detection of this kind of radioactive molecule is an important milestone in our exploration of the cool molecular universe,” said Tomasz Kamiński, an astronomer with the Harvard-Smithsonian Center for Astrophysics in Cambridge, Mass., and lead author on a paper appearing in Nature Astronomy. The researchers detected the unique spectral signature of these molecules in the debris surrounding CK Vul, which is approximately 2,000 light-years from Earth. As these molecules spin and tumble through space, they emit a distinctive fingerprint of millimeter-wavelength light, a process known as “rotational transition.” Astronomers consider this the “gold standard” for molecular detections. However, ALMA and NOEMA can only detect the amount of 26Al bound with fluorine. The actual mass of 26Al in CK Vul (in atomic form) may be much greater. It is also possible that other merger remnants may have far greater amounts. Astronomers may also have underestimated the current merger rates in the Milky Way. “So this is not a closed issue and the role of mergers may be non-negligible,” speculated Kamiński. Composite image of CK Vul, the remains of a double-star collision. This impact launched radioactive molecules into space, as seen in the orange double-lobe structure at the center. This is an ALMA image of 27-aluminum monofluoride, but the rare isotopic version of AlF resides in the same region. The red, diffuse image is an ALMA image of the more extended dust in the region. The blue is optical hydrogen emission as seen by the Gemini observatory. 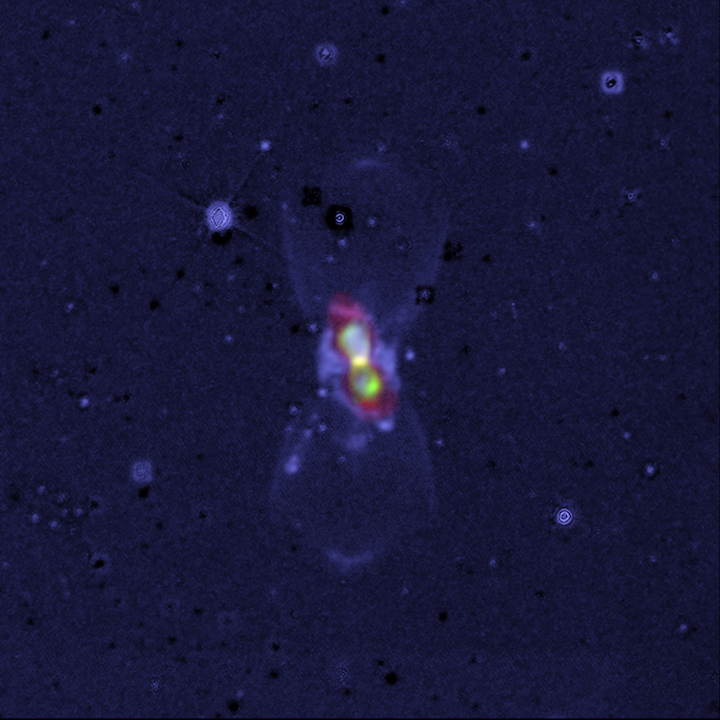 A widefield, composite image of CK Vul, the remains of a double-star collision. This impact launched radioactive molecules into space, as seen in the orange double-lobe structure at the center. This is an ALMA image of 27-aluminum monofluoride, but the rare, radioactive isotopic version of AlF resides in the same region. The red, diffuse image is an ALMA image of the more extended dust in the region. The blue is optical hydrogen emission as seen by the Gemini observatory.